Me: What kind of white wine do you have? Waiter: We have a nice conundrum. Me: Huh? Yes, apparently not only is conundrum a word which means a riddle whose answer is or involves a pun (according to Merriam Webster), but it’s also a wine with a “robust, floral and bright tropical taste.” Conundrum, the Word Detective tells us, is a “pseudo-Latin nonsense word and initially used as a derogatory term for a fussy, pedantic and silly person.” It went through a couple hundred years of iterations and is now essentially a word to describe a very difficult problem. 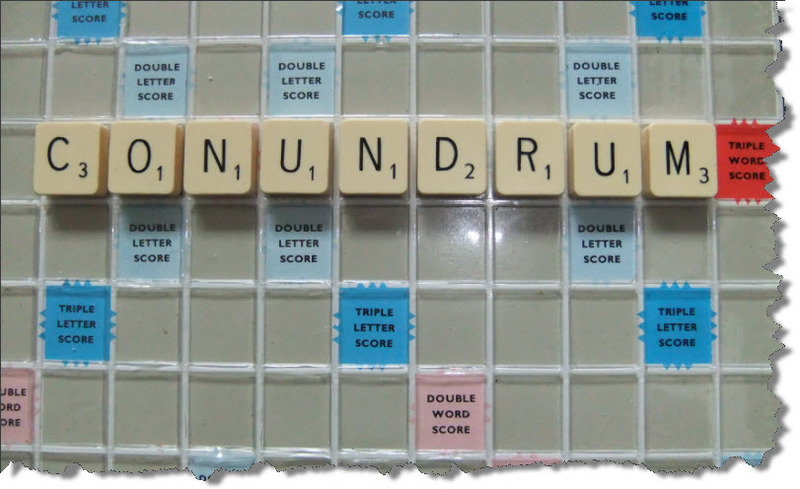 I became curious about conundrum while talking with a colleague at a dinner event (the one where I had my first fruity sip of conundrum). She told me it was a word used extensively during a recent complex major software upgrade. In researching conundrum I also found this cool website, Design Conundrum. It’s a graphic designer’s space to share beautiful and interesting things (check it out!) And best of all, there was a Doctor Who original novel with the title, Conundrum. And now, I challenge you to go forth and use conundrum at the earliest opportunity. I like the intoxicating version of this! Here is one I just came across, paraprodokians.